Model HY7000 is a high pressure hydrogen probe configuration which can be used for pressures up to 3600 psi. Hydrogen probes are commonly used for monitoring hydrogen permeation in steels, which could lead to embrittlement, blistering, and decarburization resulting in the failure of the material. This intrusive hydrogen probe assembly consists of three subassemblies (sold separately): the gauge assembly, the hollow plug assembly, and the HY7000 sensing element assembly. 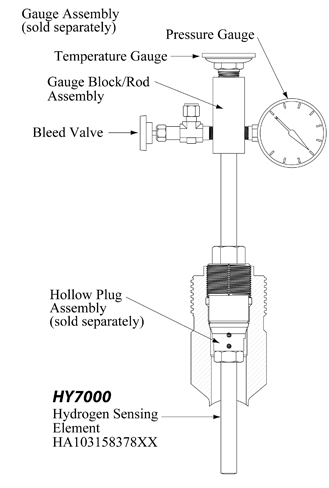 The gauge assembly consists of a gauge body, a pressure gauge (0-40 psi), a temperature gauge, and a bleed valve. The sensing element on the HY7000 probe is about 3 inches long and consists of a thin-walled tube which is sealed from the process and allows nascent hydrogen to permeate. The minimum insertion length (I.L.) of the probe is 6 inches and can be ordered in 1 inch increments. Length in inches (Ex: 6" = 06). Available in 1" increments starting at 6".